We all know that the stock market tends to go up more often than down in the upcoming month of January—right? This is known as the “January Effect,” first discovered by Sidney Wachtel in an article in the Journal of Business of the University of Chicago. And we know that market downturns tend to take place in the fourth quarter of the year—October, November or, sometimes, December. Knowing these things, you also know that if you put your money on the table in January, and take it back off the table and retreat to cash in September, you’re likely to come out ahead. The problem is that these things actually aren’t true. No month is statistically likely to produce an upturn or a downturn different from any other month. If you don’t believe this, look at the accompanying chart, produced by OfDollarsAndData.com. 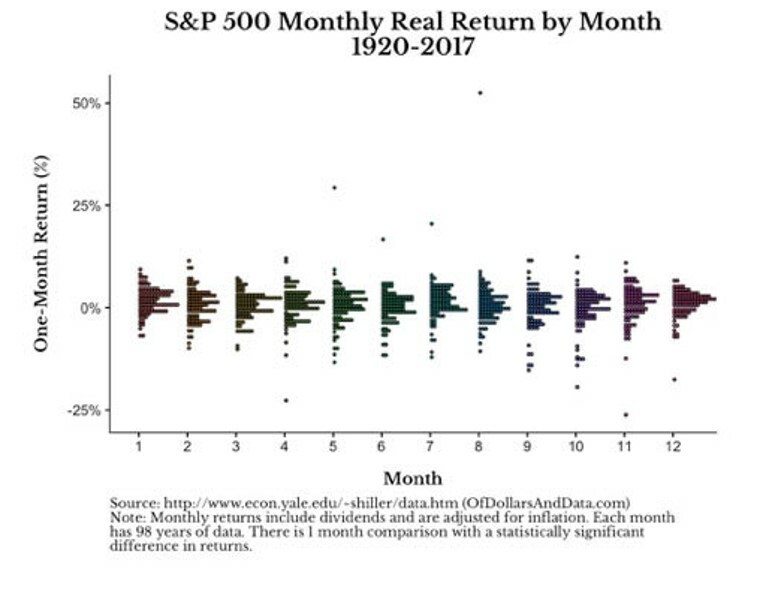 It shows that the spectrum of returns over the past 98 years is almost identical from month to month. In fact, the January Effect pretty much evaporated as soon as Wachtel’s article was published. Why? Because more people began following his advice, meaning that stock prices were bid up before January, causing January returns to level back out.